Simple wireless power transmission works because of the principles of magnetic resonance and magnetic induction. This power transmission system relies on two coils in range with each other and resonating at the same frequency. The coils need to be in range because the magnetic field of the source must be strong enough for the receiving coils to induce current flow. Matching resonating frequency is also needed to enable further transmission of power through magnetic induction. Modifications or an entirely new set of principles are, however, required in order to enable wireless power transmission to supply power over large distances. One of the examples of long-distance wireless power transmission is a 1980 experiment by Communications Research Center in Canada. The research center used a small unmanned airplane designed for communications relay and capable of being powered from a power beamed from the station for this experiment. The experiment managed to prove that aircrafts can fly (2 km diameter flight path with an altitude of 21 km) for as long as several months without the need to land by using power beamed from a distant station. This long-distance wireless power transmission option necessitates the use of a large microwave transmitter on the ground. The airplane in the experiment had to fly in a circular path because it always had to be within range of the ground-based transmitter. This enabled it to receive the microwave energy through a rectenna or disc shaped rectifying antenna receiver that converts microwave energy into DC electricity. Another option for wireless power transmission is NASA’s infrared power transmission system that is capable of powering an airplane using an infrared laser that powers the photovoltaic cells located on the airplane’s skin. 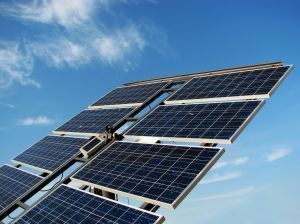 These photovoltaic cells convert infrared energy to electricity. This also requires that the device being powered be always within sight of the transmitter. One of the central devices that will be used in long-distance wireless power transmission technology is the rectenna or rectifying antenna composed of dipole antennas connected to semiconductor diodes. These diodes direct the electrons produced from the infrared or microwave energy to the circuitry on the rectenna that distributes the electrons to the system. This technology opened up the possibility of constructing power stations on the moon. These power stations will be capable of transmitting power to earth using microwave energy. 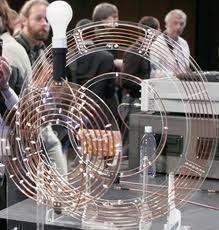 These microwave energy would then be converted into electricity using a vast array of rectenna receivers on the earth. Moon-based power stations, however, would require maintenance and supervision in order to be sustainable. Satellite networks would also be needed to transmit microwave energies to the parts of the earth that are not at the direct line of sight of the moon’s power stations. There’s also protest against constant microwave exposure. Even with all these challenges that face wide-scale application of this new technology, long-distance wireless power transmission is still being considered as a next-generation power transmission system for specialized applications. 138 queries in 0.324 seconds.